Efficient transformation and regeneration methods are a priority for successful application of genetic engineering to vegetative propagated plants such as grape. The current methods for the production of transgenic grape plants are based on Agrobacterium-mediated transformation followed by regeneration from embryogenic callus. However, grape embryogenic calli are laborious to establish and the phenotype of the regenerated plants can be altered. Transgenic grape plants (V. vinifera, table-grape cultivars Silcora and Thompson Seedless) were produced using a method based on regeneration via organogenesis. In vitro proliferating shoots were cultured in the presence of increasing concentrations of N6-benzyl adenine. 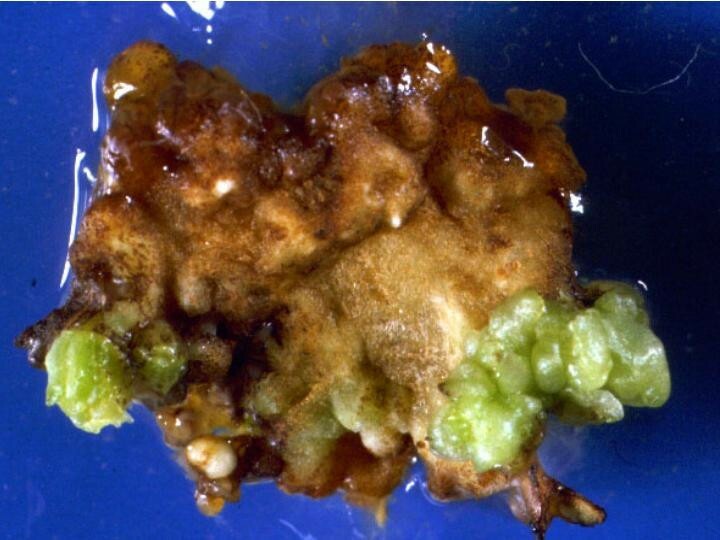 The apical dome of the shoot was removed at each transplantation which, after three months, produced meristematic bulk tissue characterized by a strong capacity to differentiate adventitious shoots. Slices prepared from the meristematic bulk were used for Agrobacterium-mediated transformation of grape plants with the gene DefH9-iaaM. After rooting on kanamycin containing media and greenhouse acclimatization, transgenic plants were transferred to the field. At the end of the first year of field cultivation, DefH9-iaaM grape plants were phenotypically homogeneous and did not show any morphological alterations in vegetative growth. The expression of DefH9-iaaM gene was detected in transgenic flower buds of both cultivars. The phenotypic homogeneity of the regenerated plants highlights the validity of this method for both propagation and genetic transformation of table grape cultivars. Expression of the DefH9-iaaM gene takes place in young flower buds of transgenic plants from both grape cultivars. The use of genetic engineering for plant improvement permits the introduction of useful agronomic traits without altering the features of the cultivar, necessitating the development of in vitro systems for the genetic transformation and plant regeneration. To date, the regeneration of grape plants has been obtained by both organogenesis and embryogenesis. Shoot regeneration from fragmented shoot apices has been successfully applied to several grape species and hybrids . Moreover, adventitious shoots have been regenerated from either leaf blades or petioles of V. rupestris, V. vinifera and selected grape hybrids . Embryogenic cultures have also been established for some grape species, e.g. Vitis longii Prince , V. rupestris Scheele [4, 5], V. x lambruscana  and V. vinifera varieties [7, 4, 8] and rootstock hybrids . Regeneration from somatic embryos has been used for genetic transformation of the major grape cultivars for production of both wine  and table grapes [11, 12]. Transgenic grape can be generated by transformation of embryogenic calli obtained from different tissues, including zygotic embryos , leaves , ovaries  and anther filaments. The latter is the most widely used tissue for these purposes [3, 10, 12]. The initiation and proliferation of embryogenic callus from anther filaments is, however, laborious and cultivar-dependent . Furthermore, regeneration by somatic embryogenesis is limited by the availability of immature flowers for the initial explant and strongly affects the phenotype of grapevine plants [6, 12, 15]. Herein, an alternative method useful for both propagation and Agrobacterium-mediated genetic transformation of table grape (V. vinifera) is described. The method is based on the formation of meristematic bulk (MB) tissue with a high regenerative capacity, using adventitious shoots as a starting material. This procedure has been used to introduce the DefH9-iaaM gene  into the genome of two table grape cultivars (Silcora and Thompson Seedless). The aforementioned gene is composed of the ovule-specific regulatory regions from DefH9 of Antirrhinum majus and the iaaM coding region from Pseudomonas savastanoi. The DefH9-iaaM gene has conferred parthenocarpic fruit development to several horticultural species improving fruit production [18–22]. The transformed grape plants show normal vegetative growth and express the DefH9-iaaM gene in young flower buds. The method has been used to genetically engineer the table grape varieties Silcora and Thompson Seedless. The method combines two in vitro processes, namely the production of meristematic tissue with a high competence for plant regeneration and the genetic transformation of this tissue, followed by selection of transformed regenerants (Fig. 1). 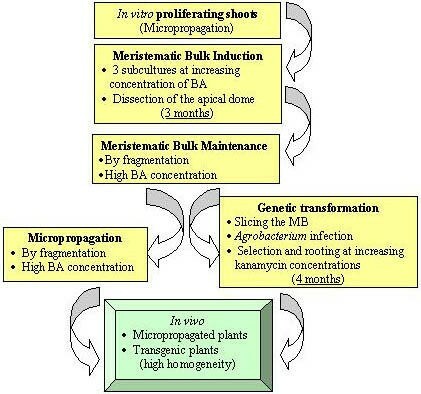 Grape micropropagation and genetic transformation: schematic representation of the in vitro processes. BA, benzyl adenine; MB, meristematic bulk. The first process generates the meristematic bulk tissue, a cellular aggregate with an elevated regenerative capacity. The protocol used to produce meristematic bulk tissue consists in four subculturing phases starting from in vitro proliferating shoots. In the first phase, the apical dome of the shoots are eliminated and the basal cluster maintained for 30 days in culture medium (IM) supplemented with 4.4 μM BA. In the second phase, after a further drastic dissection of the apical dome, the shoots are transplanted to IM medium containing 8.8 μM BA and cultured for 30 days. In the third and fourth phases, the mechanical dissection of the apical dome is repeated after 60 and 90 days of culture, respectively, and the concentration of BA in the medium is further increased to 13.2 μM. The meristematic bulk can be cultured for long periods of time on MM medium (13.2 μM BA) with the continuous formation of new adventitious buds that are clearly visible at the surface of the aggregate (Fig. 2A). The internal part of the meristematic bulk tissue shows hypertrophy of parenchyma cells with highly vascularized bands (Fig. 2B), including many initiation nodules (Fig. 2C) from which adventitious buds originate (Fig. 2D). 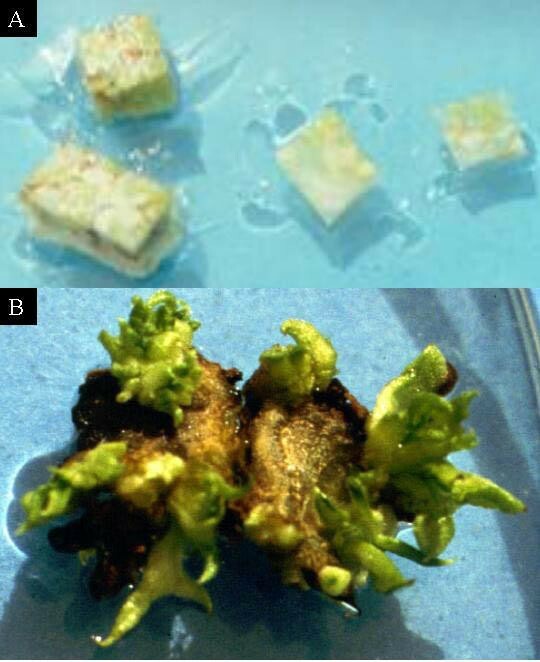 Meristematic bulk tissue (MB) generated from in vitro-proliferated grape shoots: (A) standard proliferation stage; (B) Internal section (×40) of the MB showing hyper-trophic parenchymatous cells with highly vascularized bands; many initiation nodules (×40) are also visible (C). The nodules generate adventitious buds (×5) (D). This meristematic bulk tissue can be easily propagated: the tissue is fragmented and each fragment generates a new meristematic bulk tissue after 3–4 weeks of culture. Moreover, by cutting the meristematic bulk tissue in small slices (1 cm2, 2 mm thick), tissue layers (Fig. 3A) that produce high numbers of regenerated adventitious shoots (about 20 per slice within four weeks of culture on MM medium) are obtained (Fig. 3B). These meristematic slices are suitable as a starting material for both vegetative plant propagation and genetic transformation. Grape regeneration via organogenesis: (A) slices (approx. 1 cm2, 2 mm thick) prepared from the MB and used for propagation or genetic transformation; (B) shoot regeneration obtained after 30 days of culture (×5). Grape plants of the cultivars Silcora and Thompson Seedless were transformed with the DefH9-iaaM gene. Meristematic slices of the two cultivars were inoculated with agrobacteria harboring the DefH9-iaaM construct. After 30 days on medium containing 25 mg l-1 kanamycin, a high number of regenerants were obtained. When transferred to medium containing higher concentrations of the antibiotic (50 mg l-1), many of the regenerants became yellowish, and were discarded (60 days). The selection of stable regenerants was obtained after an additional 30-day incubation on medium with an even higher concentration of kanamycin (75 mg l-1). During in vitro selection, only the transformed cells maintain a high regenerative capacity, while the other parts of the meristematic tissue become progressively necrotic (Fig. 4). Three to five regenerants were isolated per meristematic slice and transferred to rooting medium containing 75 mg l-1 kanamycin. About seven months following the initiation of MB tissue culture, 50 putative transgenic lines of the two grape cultivars were isolated. Regenerating transgenic lines on the selection medium supplemented with 50 mg/l kanamycin 60 days after infection. The transgenic state of 10 in vitro rooted plants of the cultivar Silcora and five plants of the cultivar Thompson Seedless was determined by Southern blot analysis. Eight out of ten plants of the cultivar Silcora were transgenic for the DefH9-iaaM gene. The eight transformants arose from three independent events: #6, #29, and #35, had 2, 3, and 1 copies of the transgene, respectively (Fig. 5A, lanes 3, 5, and 6). Of the five Thompson Seedless plants analyzed, three were transgenic for DefH9-iaaM. All the transgenic plants were recovered from a unique transformation event (line #4) and had a single copy of the transgene (Fig. 5A, lane 1). 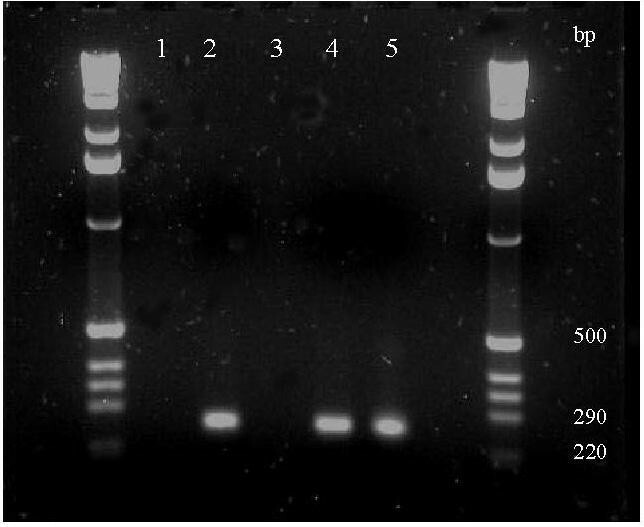 Southern blot analysis of grape plants transgenic for DefH9-iaaM gene. (A) Genomic DNA (digested with HindIII) from control untransformed Silcora plants (lanes 4, 7), three independent transgenic Silcora lines (plants #6, #29, #35, lanes 3, 5, 6, respectively), control untransformed Thompson Seedless plants (lane 2) and transgenic Thompson Seedless line (plant #4, lane 1). (B) Schematic drawings of the constructs used for transformation of Silcora (right) and Thompson Seedless (left) plants are reported. The probes are indicated with grey boxes. Only restriction sites relevant for Southern analysis are indicated. LB, left border; R, right border. The expression of the DefH9-iaaM gene in transgenic flower buds was analyzed by RT-PCR (Fig. 6). An amplicon of 266 bp corresponding to a fragment of the spliced DefH9-iaaM transcript was detected when mRNA extracted from flower buds of DefH9-iaaM transgenic Thompson Seedless plants (line #4, Fig 6, lane 2) and Silcora plants (lines #6 and #35, Fig. 6 lanes 4 and 5, respectively) was used as template for RT-PCR analysis. 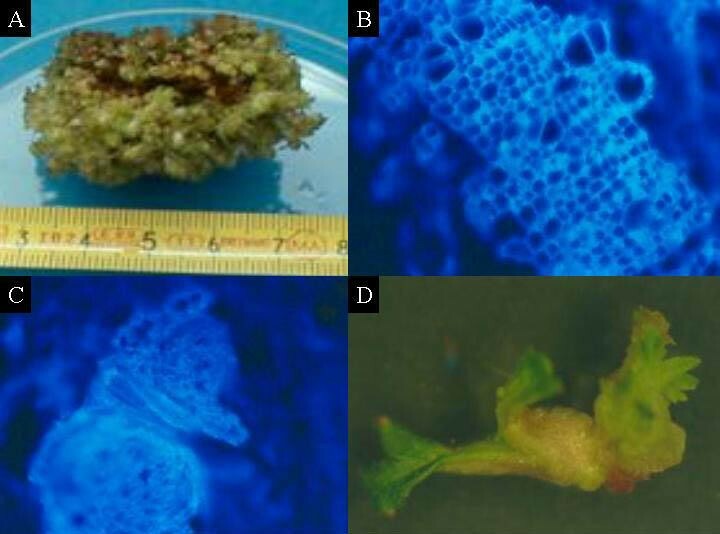 No amplicon was detected using mRNA extracted from flower buds of untransformed Silcora and Thompson Seedless plants as a template (Fig 6, lanes 1 and 3). Thus, in both cultivars the inserted transgene is expressed in the proper organ. RT-PCR analysis of flower buds from transgenic grape plants. Analysis was performed with single strand cDNA synthesized from mRNA extracted from young flower buds of Silcora control and transgenic plants #6 and #35 (lanes 3, 4 and 5, respectively) and Thompson Seedless control and transgenic plants (lanes 1 and 2, control and #4, respectively). The amplification product of 266 bp corresponds to the 5' end of the spliced DefH9-iaaM mRNA. The transgenic plants of the two table grape varieties were proliferated in vitro and after acclimatization in the greenhouse, they were then transferred to the field as self-rooted plants. Forty plants for each independent line were grown (Silcora lines #6 and #35 and Thompson Seedless line #4). During field development, the plants showed normal vegetative growth and appeared healthy. Transgenic and control lines of both Thompson Seedless and Silcora showed a high similarity in leaf morphology (Fig. 7 and 8). 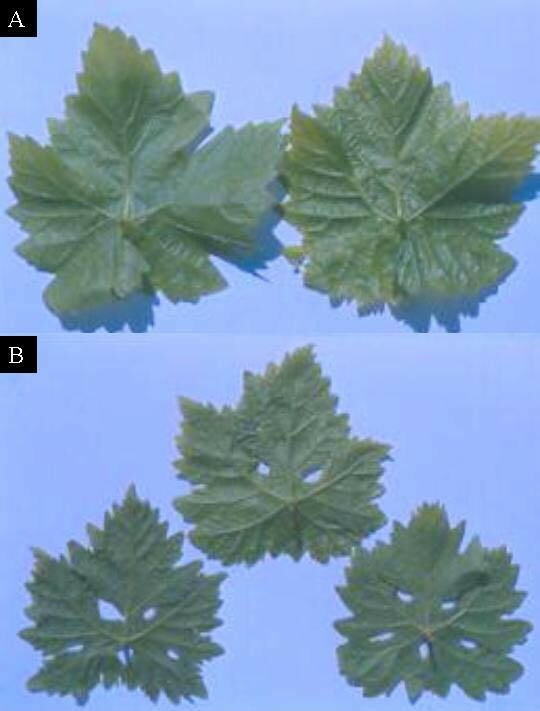 The similarity is already evident in the first expanded leaves (Fig 7A Thompson Seedless left: control, right: line #4; Fig 7B Silcora centre: control, left and right: lines #6 and #35, respectively). 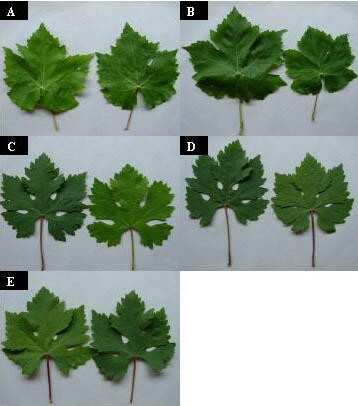 The comparison of adult leaves (from the 6th to 12th position on the branch) of transgenic and control lines from either Thompson Seedless (Fig. 8 panel A: control; panel B: line #4) or Silcora (Fig. 8 panel C: control; panel D: line #6; panel E: line #35) confirmed their morphological resemblance. First expanded leaves of transgenic and control lines of Thompson Seedless (A. left: control; right: line #4) and Silcora (B left: line #6; centre: control; right: line #35). Adult leaves (collected from the 6th to 12th position on the branch) of transgenic and control lines of Thompson Seedless (A: control; B: line # 4) and Silcora (C: control; D: Line # 6; E: Line # 35). Transgenic Thompson Seedless plants show the main features reported in its ampelographic description . The only and rather trivial difference observed in adult leaves of the transgenic line was the presence of slightly deeper lower-lateral sinuses in comparison to control (Fig. 8B). It is worth noticing that the leaves of both cultivars had neither lobes nor red-vein, alterations observed in plants regenerated in vitro by Franks et al. . The DefH9-iaaM grape plants are currently under agronomic (i.e. field trial) evaluation for fruit development and total fruit production. Transgenic grape plants are typically regenerated from somatic embryos derived from either zygotic embryos or leaves [11, 13], or more recently, from anther filaments [10, 12]. In our method, transgenic grape plants are regenerated via organogenesis; a meristematic tissue with high regenerative capacity is established from in vitro standard proliferating shoots and used for both propagation and A. tumefaciens-mediated transformation. Combined with the removal of the shoot apices, the progressive increase of cytokinin content in the media abolishes the shoot apical dominance and also promotes basal proliferation, leading to the formation of meristematic bulk tissue. This is a large aggregate of meristematic tissue, which includes parenchymatous as well as primary and secondary meristematic cells. The tissue layers prepared by slicing the meristematic bulk show a high meristematic/regenerative competence and within four weeks, produce a high number of regenerated adventitious shoots (about 20 per slice). This meristematic tissue is produced in a relatively short period of time (90 days) and is valuable for both vegetative plant propagation and genetic transformation. For the success of Agrobacterium mediated transformation, the slicing of the meristematic bulk is a critical aspect, producing tissue composed of cells having a high regenerative capacity and a large number of damaged cells. This latter population of cells is known to produce substances that activate the mechanism of genetic transfer from Agrobacterium . The main advantage of this transformation method is represented by the shoot regeneration efficiency, which is higher than that achieved by organogenesis using lateral axillary shoots or leaf. In fact, an average of 3–5 regenerants per shoot and 0.1–0.5 regenerant per leaf are produced . On the other hand, a selection strategy based on the progressive increase of the concentration of kanamycin was designed to limit the number of escapes or chimerical events. For both cultivars, untransformed kanamycin resistant plants represented an average of 20% of all plants analyzed. High concentrations of kanamycin cause oxidative damage to non-resistant tissues and lead to progressive necrosis. It has been reported that the presence of necrotic areas in transformed grape embryogenic tissue may affect the regeneration efficiency . In our system, although the highest concentration of kanamycin (75 mgl-1) induced an extensive browning and necrotization of the meristematic slices, the regeneration capacity of the transformed cells was unaltered. The production of transgenic grape plantlets requires four months of culture starting from meristematic bulk; seven months are needed if in vitro proliferating shoots are used as the starting material. Grape transformation methods based on the induction and selection of somatic embryos are comparable in length . However, they appear to be more laborious with respect to the in vitro manipulations required for regeneration (establishment of embryogenic callus and embryos selection, maturation and regeneration) . They also present a disadvantage regarding the availability of the starting material (in particular anthers filaments). At the end of the first year of field cultivation, the transgenic grape plants were phenotypically homogeneous and highly similar to the control plants. Moreover they did not show the alterations observed in grape plants obtained with different methods of regeneration, such as stronger anthocyanin pigmentation, reduced vigor, leaf lobation, and albinism [12, 15, 16]. It is worth noting that the transgene was expressed in the flower buds of DefH9-iaaM plants of both grape cultivars. Thus to date, the DefH9-iaaM gene has been shown to be properly expressed in three different plant families: Solanaceae [17, 18], Rosaceae , Vitaceae (present manuscript). The present report describes a new method for table grape (Vitis vinifera) genetic transformation. This method of transformation differs from previously described techniques with respect to regeneration (based on organogenesis rather than embryogenesis) and it is characterized by a higher regeneration efficiency, achieved through simple in vitro manipulations. Moreover, the phenotypic stability and homogeneity of the regenerated plants during the vegetative growth, highlights the validity of this method for both propagation and genetic transformation of Thompson Seedless and Silcora table grape cultivars. It is likely that the method can be applied to other grape cultivars, for example cultivars used in the wine industry. The transgenic plants express the transgene in the proper organ. Agronomic evaluation of the productive performance of DefH9-iaaM transgenic grapes will permit to evaluate the utility of this molecular tool in grape scion improvement. In vitro proliferating cultures of Vitis vinifera, table grape varieties Silcora (I.G 235023) and Thompson Seedless, were initiated from shoot-tips and subcultured monthly on propagation medium (PR). This medium is composed of MS basal medium  supplemented with 4.4 μM benzyl adenine (BA), 3 % sucrose, and 0.7% commercial agar (pH 5.6). The cultures were kept at 25 ± 1°C under a photoperiod of 16 h light (70 μmol·m-2·s-1 photosynthetic photon flux) provided by warm white fluorescent tubes. Proliferating shoots were subjected to chemical and mechanical treatments to induce the formation of meristematic bulks characterized by a strong capacity to differentiate adventitious shoots. The medium used for the initiation (IM) of the meristematic bulk (MB) contained KNO3 (1050 mg l-1), NH4NO3 (400 mg l-1), KH2PO4 (200 mg l-1), MgSO4 7 • H2O (400 mg l-1), CaNO3 (750 mg l-1), NaH2PO4 (200 mg l-1), microelements and vitamins by MS , 3% sucrose, 0.7% commercial agar, and 0.05 μM NAA. IM medium was supplemented with 4.4 μM BA for the first 30 day subculture, after which the BA concentration was doubled (8.8 μM) for the second 30 day subculture. MB was maintained on IM medium supplemented with 13.2 μM BA (MM medium) and subcultured every 4 weeks. The mechanical treatment consisted in the elimination of the apical dome of the initial proliferating shoots. This procedure was repeated, at each transplantation, until the MB was obtained. The inner part of the MB was cut in thin slices (1 cm2, 2 mm thick), which were transferred to fresh MM medium and used for both micropropagation and genetic transformation. For histological analysis, the meristematic bulk tissue was cut using a cryo-microtome. The resulting 20 μm-thick slices were stained with the DAPI fluorescent staining . The samples were analyzed using a Nikon microscope equipped with an epifluorescent light source. Transformation experiments were carried out using A. tumefaciens strain C58 GV3101  harbouring the parthenocarpic gene DefH9-iaaM  cloned in the pPCV002 binary vector . The T-DNA of the vector contains the nptII coding region, conferring kanamycin resistance as selectable marker. 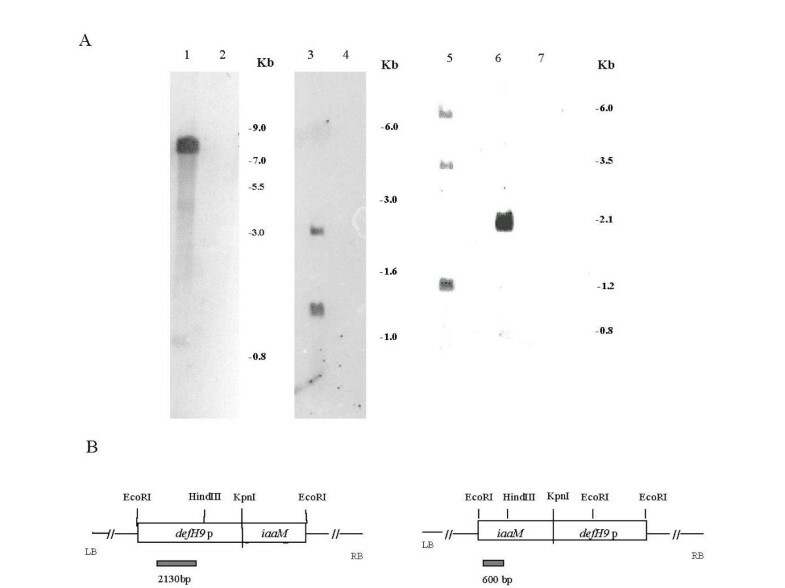 Bacteria were cultured in the YEB medium (1 g l-1 yeast extract, 5 g l-1 beef extract, 5 g l-1 peptone, 5 g l-1 sucrose and 2 mM MgSO4, pH 7.8) containing 50 mg l-1 kanamycin, 100 mg l-1 rifampicin, and 100 mg l-1 streptomycin. Bacterial cultures (A420 0.5) were grown overnight (29°C – 150 rpm), centrifuged, and resuspended in MS salts supplemented with 2% sucrose, 1 mM acetosyringone, 1 mM proline (pH 5.2) for 5 hrs at 28°C. Slices (1 cm2, 2 mm thick) obtained from the MB were dipped in the bacterial suspension for 15 min. After infection, the slices were blotted with sterile filter paper and placed on MM medium. After 48 hrs at 28°C, the explants were transferred to the same medium enriched with 25 mg l-1 kanamycin and 200 mg l-1 cefotaxime and maintained for 30 days. The explants were then transferred and subcultured on a monthly basis on the same medium with increasing concentrations of kanamycin (50 and 75 mg l-1). Detectable regenerants were isolated and transferred to rooting medium containing macroelements by Quoirin and Lepoivre ; microelements and vitamins by MS ; 4.9 μM IBA; 5.7 μM IAA; 3% sucrose, and 0.7% commercial agar, supplemented with 75 mg l-1 of kanamycin. The in vitro rooted transgenic clones of Silcora and Thompson Seedless were grown in a greenhouse for acclimatization (30 days) and weaning (60 days) and then transferred to the experimental field. Untransformed plants produced by standard micropropagation techniques were used as controls in field experiments. Genomic DNA was extracted from 1 g of frozen leaves or shoot apices using the Nucleon PhytoPure system (Amersham Pharmacia) according to the manufacturer's instructions. Ten μg of DNA from transgenic plants was digested with 70 Units of HindIII. The DNA was subjected to electrophoresis on a 0.7% agarose gel at 4.5 V cm-1 and transferred to a nylon membrane (Hybond N, Amersham). The membrane was hybridized with 100 ng of fluorescein-labeled probe prepared using the Random Prime Labeling Module kit from Amersham. The probe was either a 600 bp-long DNA fragment of the iaaM coding region (Silcora plants) or a 2130 bp-long DNA fragment of the DefH9 promoter (Thompson plants). Detection was performed with anti-fluorescein AP conjugate (Amersham) and the chemiluminescent alkaline phosphatase CDP-Star substrate (Amersham) according to the manufacturer's instructions. The membranes were exposed for 1 h using Kodak XAR-5 film. Flower buds (0.5 cm long) were frozen in liquid nitrogen and total RNA was extracted by using the NucleonPhytopure system (Amersham). The system was slightly modified by the addition of Polyclar AT (95 mg g-1 of fresh tissue) and Na2S2O5 (0.4 %) to the homogenization buffer. The RNA was recovered by LiCl precipitation. Poly(A+)RNA was isolated from total RNA using oligo d(T) Dynabeads (Dynal) following the manufacturer's protocol. The amount of mRNA extracted was determined spectrophotometrically. Messenger RNA (1 μg) was used as a template in the reverse transcriptase reaction primed with oligodT20. First strand cDNA (30–50 ng) was amplified with the forward primer 5'-CTTTGGAACTCGTGTTGAGCTCTCA-3' (corresponding to the DefH9 ULR region +89 +113, with +1 the transcription initiation nucleotide). The 3' primer was 5'-ACTATCGCTACCCGAGGGGTGGGC 3', complementary to the iaaM coding region from +131 to +108 bp. The resulting amplicon (266 bp), corresponding to a fragment of the spliced DefH9-iaaM mRNA, was characterized by sequence analysis. This work was in part financed by the program "Biotecnologie II" of the CNR. The authors thank Angelo Spena for helpful advice. BM carried out the histological and phenotypic analysis, participated in the genetic transformation. TP carried out the molecular analysis. ON carried out the "in vitro" regeneration, proliferation and selection. LL carried out the genetic transformation and participated in the histological study. All authors read and approved the final manuscript.